The educator should incorporate articles that explain the carbon cycle and chemical equations, and possibly more information to provide more evidence for global warming and the connection between CO2 in the atmosphere and global warming. It is a good idea to have a larger sized diagram of the carbon cycle (that is legible) available for student use. It is an easy introductory lesson to the carbon cycle. The activity effectively shows oxygen production of Elodea photosynthesis. Diagrams included to help explain procedure and carbon cycle. The educator will have to go to other sources for background material if needed. 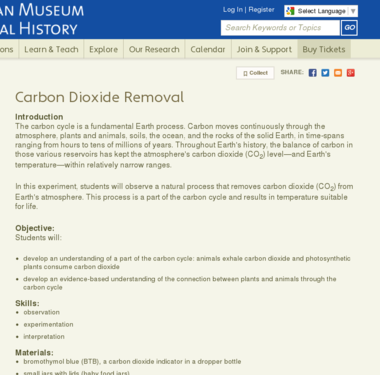 Comment from expert scientist: This activity should be supplemented by additional and more in-depth information about the carbon cycle. It is important to note that fossil fuel combustion, vegetation burning, and deforestation, as well as plant soil respiration, are important other sources of CO2. This lesson is a basic, hands-on activity that can be done in teams. Lesson plan is written in a "cookbook" style. Educator will have to make sure that the students' understanding is actually built. Multiple modalities are utilized in this lesson to address different learning styles.